Samuel Beckett died in 1989 at age 83, which gives one pause upon seeing that the current staging of his monodrama “Krapp’s Last Tape” produced by Shattered Globe Theatre is directed by Beckett himself. 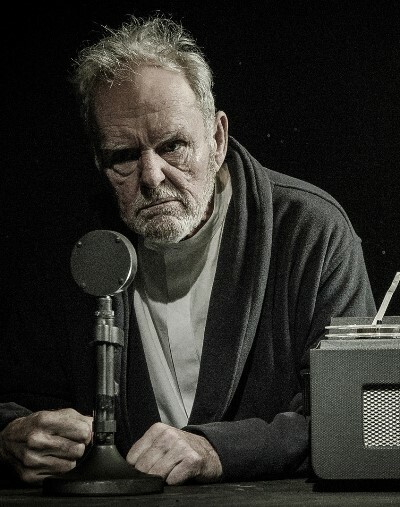 The answer is that the masterly impersonator of Krapp before us, Rick Cluchey, acquired the ticks, wrinkles and regrets of this hermetically sealed old man while working with Beckett late in the playwright’s life. Chicago-native Cluchey, 79, took a circuitous, highly improbable path to the Parisian world of Irish-born Beckett. Cluchey was serving a life sentence in San Quentin prison when he came in contact with Beckett’s work, became interested in drama and helped to organize a theater program at the prison. Upon his release, he began working directly with Beckett, portraying Krapp for the first time, in Berlin, in 1977. 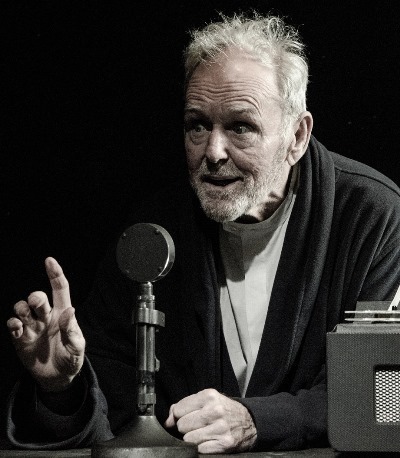 For many years, Cluchey has toured internationally with his Beckett-directed perspective on Krapp, supplementing performances – as he does here – with a session of reminiscences about the celebrated playwright and seven years of their close association. To hear Cluchey tell it, playing Beckett’s characters under the playwright’s acutely critical eye was a trial by fire. Yet out of that forge, the actor has emerged with a singularly beguiling embodiment of Krapp, this emotionally shrunken figure who now looks back on his life as a chronicle of folly, a ledger ruled by losses. The little black-box space Shattered Globe is using at Stage 773 lends an ideal aura of darkness and claustrophobia to Beckett’s play. This is old Krapp’s basement. At age 69, he’s hardly what one might call superannuated, but his world-weariness, his deep melancholy, has pushed him to the brink of doddering senility. 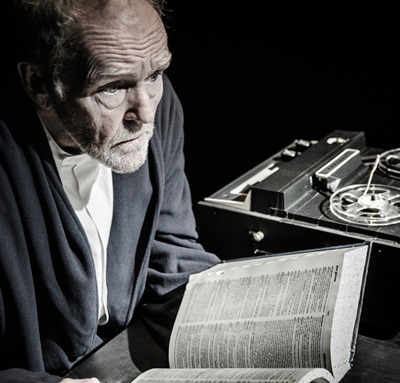 Krapp has an annual ritual, a solitary and perverse observation of yet another birthday: He makes an audio tape of commentary on the year just passed – indeed on all the years past. This he does after sampling some of his previous such documentaries. Thus he adds to the body of his self-evaluation, and it’s pretty clear – as we listen to an old tape with him, one made three decades prior, when he was 39 – that he never has had much use for himself as a younger man, at any age. It’s also evident that Krapp has suffered long, suffered in his soul for the cavalier way he threw away a woman’s love. Beneath his scowling and scoffing, these rough but permeable defenses, lies a heart broken beyond repair. Krapp knows the where and how and when of his every misstep; yet even as he looks back with contempt upon the fool that he was, he cannot stop replaying the tape, cannot stop re-inflicting the wound and bleeding again. In Cluchey’s stooped, gnarled, hesitant form, Krapp’s carelessly worn robe appears tailor-made. This wizened character might be in the actor’s DNA. Every anguished guffaw and oddly angled move comes from a place of authentic resignation. There will be no redemption for Krapp, no lights will come on to drive away his subterranean darkness. He lost his way long ago and gave up on the journey. Some relief from the blackness comes in the kind of Beckett comedy one finds in, say, “Endgame.” It’s the weird, bleak comedy of despair. Cluchey makes mad stuff of Krapp’s compulsive, ritualistic consumption of bananas as prelude to his session with the tape recorder. We get some insight into the old man’s dementia as, with deliberate gestures, he extracts the bananas from a desk drawer, consumes the fruit, then suddenly flips the peel away – any which way. Then there are the time-outs when Kapp pauses for a beverage in the back room, out of sight. He angles himself through a rear door into a space where we hear him – and “see” in cast shadows – opening a bottle, pouring, gulping. Cluchey makes furtive, guilty business of these tippling breaks, just as he makes grand absurdity of the banana bit. 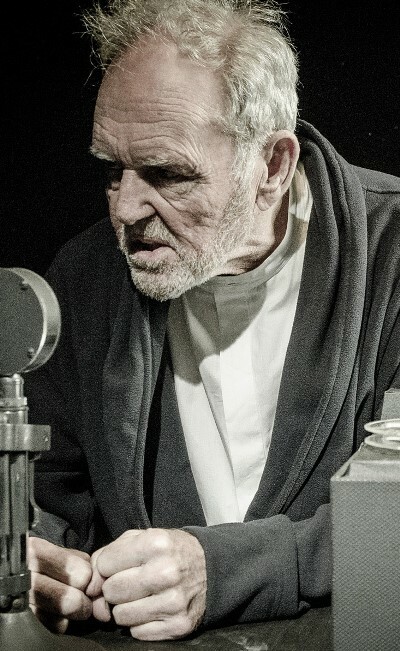 “Krapp” is a shuddering portrait of human disconnect, and Rick Cluchey preserves Beckett’s spectral penitent down to his last rueful inflection and decrepit smirk.